The Whim. pots, pans and people: the development of Scotland's industrial pottery was the intriguing title of George Haggarty's talk to Dumfriesshire and Galloway Natural History and Antiquarian Society. George has had an interesting career in that he was a hands-on archaeologist, then he became a successful antique dealer in Edinburgh and ten years ago he returned to the National Museum as a research assistant and has published 122 papers. As his archive can boast 10,000 slides we knew that we were to be treated to a very special evening of interesting illustrations, which cause headaches to the reporter trying to convey the richness of such a talk. Hitherto it has been generally accepted that Scotland's industrial ceramics date from 1748 in the Glasgow area. This is not strictly true because experimental work in the field began c1610, about which one can only speculate. Many of the early factories were sited on the East coast from Fife to East Lothian. The next significant development arose when a potter arrived c1703 from Ireland and set up work at Leith under the auspices of Lind, who resided in Gorgie in Edinburgh. Archibald Campbell, Duke of Argyll, set up a unit on a 1000-acre estate, shown on General Roy's map in 1745 as the Whim Estate, which he bought on a whim, hence the name. Lind was associated with this the first purpose-built laboratory, about which much detail has survived except for the exact location. Argyll bought two kilns in London in 1749: one was destined for Whim but what of the other one? The idea is that it might have been for West Pans. The paintings on the Whim ware were very sophisticated and it might tie up with the fact that Cooper, an artist, married Lind's daughter. There is a special type of pottery called A-Mark ware, the clay for which came only from Carolina. Only four pieces in very poor condition are known. A cracked cup went for over £13,000. It was not considered to be Scottish and yet it was discovered that on 11th June 1754 such clay came into Leith. Lind died in 1754. Argyll lost interest. Stalemate ensued for the next 10 years. Lind's son, George, entered the field along with Thomas Shelly, potter and Ed Ackers, china painter. Excavations at West Pans have revealed that moulded ware was being made. It is known that there were slipwear potteries at West Pans pre-1760s. The remains of a redware kiln of the 1750s have been uncovered. There are few pieces of the rare West Pans pottery known. The NMS acquired one such piece in October 2011. A tea bowl of West Pans porcelain dating from the period 1764–1777, when William Littler was working in Scotland, with lobed moulding and showing the arms of Pringle of Stichill was found in East Lothian. Sadly items thought by experts to be English have been lost to Scotland and the regret is that they are now known to be Scottish in origin. In 1750 Cadell, a local merchant, was in touch with people in Birmingham such as Dr Roebuck and Samuel Gabett in connection with the Old Kirk Pottery at Prestonpans. A factory producing sulphuric acid, scarce in Scotland, was set up at Prestonpans and a pottery was built alongside. One white salt-glazed bowl, which was donated to the masons, survives and illustrates the strong link between potters and freemasons. Shipowners were looking around for a type of pottery which could be used for holding lime drinks supplying vital vitamin C to sailors, as lead was obviously unsatisfactory. 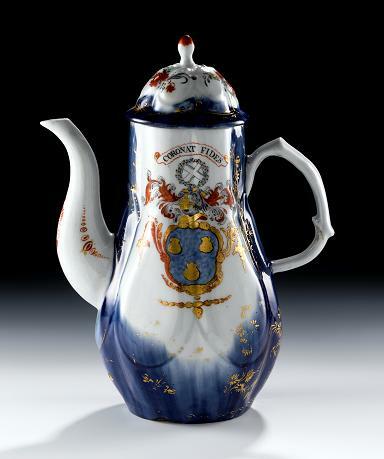 By 1805 changes were taking place as neo-classical ware emerged in the form of dipped and rouletted pearlware. A copper roller ran round the pottery to decorate it. Some Scottish output can be traced to individual factories by the rouletting. Lottery money is being sought for further study into early Scottish ware, a decision about which will be made in December. Analysis of salt glazes will be made to try and prove that items were made in Scottish factories. Excavations at Seacliff, Prestonpans, yielded a ceramic mould for the coronation of William IV and Queen Adelaide in 1831. The paintings on Scottish ceramics are generally better than those on English pieces: they are more natural and the backs are also painted. There was another factory at Morrison's Haven about 1750. Anthony Hilcoat was producing pottery on Lord Hyndford's estate. An example of Newbigging Pottery from Musselburgh takes the form of a moulded bone bowl, decorated with the arms of Musselburgh possibly to mark the visit of George IV to Scotland in 1822. James Watt (1736-1819) was working at the Bo'ness factory for Roebuck. When the latter went bankrupt Watt moved to Birmingham. The siting of a plethora of such factories on the east coast was determined by the presence of coal. It took 12 tons of coal to fire one ton of clay. A number of the Scottish potteries failed for lack of capital. By 1830 only the properties producing quality wares were surviving, largely in England, such as Spode and Wedgewood. However, the Portobello factory functioned until 1973. George halted his talk with the promise that the history of the more illustrious Glasgow pottery remains to be told on another day. Haste ye back, George!